…which in turn led me to making my first yarn purchase! A blend of 25% angora and 75% merino wool. The lovely lady taught me about the properties of angora and why its best blended with other yarns… do check out the website for more information. I’m not a huge fan of the selfie but I did take this one with my partners in crime, my husband and daughter who came with me so enthusiastically all weekend!! We saw Ellen from Pollevie again – I attended a workshop with Ellen last month in Brighton (blog post coming soon!) and her display was just so colourful and wonderful- she designs and makes the most beautiful wraps and bags. We also met fellow designer Fran Morgan who was so lovely… I could have talked for so much longer! There were some wonderful encounters – some brief, others a little longer, but all very special. I had heard through Instagram that many fellow Instagram creatives were meeting for lunch on the grass outside the main entrance so this is where we headed and I met lots of fellow bloggers and Instagram friends… including Rosina from zeensandroger as well as meeting new people such as Claudia from Crochet Luna who was extremely generous in giving people gifts she had brought from California… a mini skein of yarn (it matched my coat!) 🙂 There was a fun conversation about how to pronounce the Dutch yarn brand “Scheepjes”… and being half Dutch I was able to help! She was just lovely and we talked about our blogs and how they are our first love before Instagram and Facebook… I have always felt that way about my blog too… Instagram is a great way to get in touch with fellow crafters and it draws big numbers through quick posts and ‘likes’, but it is my blog where I can really put my fuller content. Lucy’s Attic24 blog is so inspiring. Lucy’s studio room is also gorgeous and there was a visitors book to sign too. She was so kind and enthusiastic in talking about her sheep and she took my phone to take some photos! It was a lovely moment… the perfect end to a perfect day! And my daughter really wanted to go and see the friendly sheep which she had missed the day before… they really were adorable and she got to see them- yay! That’s indicative of just how overwhelming the festival was at times… there are lots of people I was hoping to meet that I either didn’t see at all or it just didn’t feel right to approach them at the time I saw them… I suppose that’s the nature of a big event like this with so many people there. And I also wanted to say farewell to fabulous Ellen @polle_vie who had travelled from The Netherlands! Plus I had a final chance to say ‘hello’ to some other lovely people who approached me as they had taken part in my crochet along. It’s so wonderful that there is as much focus on crochet as there is on knitting. I have often visited yarn shops or events where I feel crochet is given a back seat in favour of knitting, but not here! 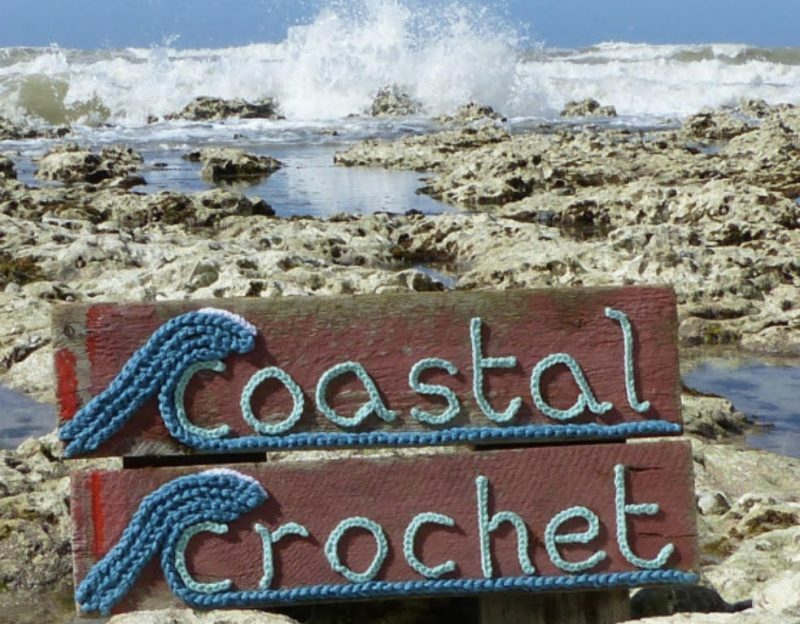 Both crafts are embraced and celebrated and if anything there seems to be more crochet than knitting, especially with the mandala displays and the yarn bombs! It was lovely for me that I went with my hubby and daughter… I wouldn’t have wanted to go all that way on my own and at the times the festival felt a little overwhelming it was nice to have them with me… They seemed to enjoy it too (the atmosphere was really lovely) and my hubby treated himself to some wool socks and my daughter got some keyrings and also seemed very drawn to the stalls with felt displays. Were any of you there? I’d love to hear your thoughts about the weekend… Have any of you been in the past or are you hoping to go in the future? Or are there any other yarn festivals I need to be going too? Previous Post: See you at… Yarndale! Wow! Thanks so much for sharing Eleonora – what a wonderful account of your weekend. I can’t quite believe how much you fitted in!!! A spectacular itinerary. Just lovely to see the selfie of you, your husband and daughter. I’m not sure I could face the crowds, so it is extra special to see your photos and read your post – I feel I’ve been there. Thank you. Such an awesome adventure. Thanks for sharing. Lovely post. What a lovely post, I really enjoyed seeing such a great overview of Yarndale as I live in NZ too far to pop in !! I can at least contribute each year and also buy from the shop which is great. Thank you again. Carolyn. What a wonderful experience for you and a feast for the eyes for the rest of us. So much beauty, so much art and so much eye candy. i can’t tell you how much I enjoyed your photographic tour of this event. It was a great blog post! I live in canada,, so too far to travel ,,, but maybe someday!? I’m so pleased you had such a marvellous weekend at Yarndale. I remember feeling overwhelmed when I first walked in. I’ve never seen so much yarn. How wonderful for you to meet lots of different people too. What a beautiful and colourful Yarndale post Eleonora. I’m so glad you enjoyed it, I can associate with your feelings of being overwhelmed. When I went a couple of years ago I felt much the same way and was disappointed that I’d missed some stalls (like Little Box of Crochet which I subscribe to) despite walking around it countless times. Lucy was lovely when I met her and I felt so privileged to have visited her crafty space above Coopers – that was very special for me. I hope that one day I am able to return! A wonderful post! I’ll probably never get to Yarndale, being from the States, but your travelogue made me feel like I was right there with you… thank you! Ah, this was such a lovely read, and worthy of the journey you undertook. Isnt it wonderful when family supports us in these ways too. It’s great to see your finds and I love the colours you chose on your last day – so ewe of course. What a treat to find the local sheep and get to commune with them. You looked so pleased in the centre of it all. It may interest you to know that for us here, to travel 600 kms in a day is kinda normal – not everyday normal, but certainly something we do frequently through out the year…. now if it took me 8 hours to do half that I would be daunted too… so, we are pretty lucky to be able to travel one way in about 3hrs and see some wonderful things in our province. Hope we will see what you make with your Yarndale finds. Cheers! That sounds like such an amazing weekend! I definitely have to go someday. Just realised I was in Skipton this summer with a camp I help out with so I already know where it is, which is much less daunting! I can’t believe you managed to resist all that beautiful yarn, how did you not come home with a trolley full? ?